Words by Kevin Doocey on August 13, 2011 . It’s being reported across a few media outlets that Newcastle United have reached an agreement with Erik Pieters of PSV and the Dutchman is set to arrive on Tyneside on a four year deal. Pieters, who is being sought after by Alan Pardew to replace the departed Jose Enrique is believed to have met the release clause in Pieters contract which is rumoured to have been about £6m. We are in desperate need of a new left-back following Enrique’s move away, but just one arrival for that position isn’t very encouraging. We need a couple of LB’s in the squad not just one, because as we all know - injuries usually strike NUFC at the worst possible time. £6m is a decent amount of money for the hierarchy to spend on one player, but of course this is only Jose’s cash simply being reinvested. However, it’s good to see that we are moving quickly to replace him, and efficiently as well. Of course one might argue that he should have been signed before Enrique signed, but that might have meant we would have had to settle for a fee a little bit less than what we got for the Spaniard in the end - with Liverpool knowing that we were eager to get what we could for him whilst he was under contract. There had also been talk of us bidding for Aly Cissokho but a fee in the region of €15m had been rumoured as the amount of prize him away from Lyon - an amount NUFC weren’t going to spend by any stretch of the imagination. Talk yesterday claimed that Pieters wasn’t interested in a move to St.James’ Park but as we know now - he’s very eager to rise to the challenge of playing for Newcastle United and in the best league in the world; the Premier League. On another note, we’re about an hour and a half away from KO at St.James’ Park between NUFC & Arsenal - really looking to forward to seeing our new look team in action and how we’re lining up. I imagine most other fans are the same. 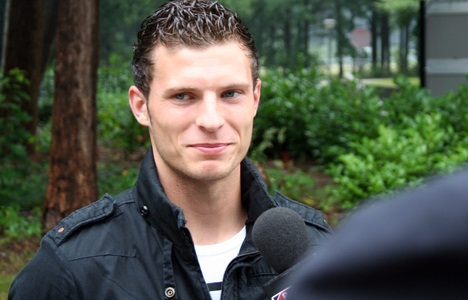 If I'm not wrong I think it's Marcus Berg on the picture and not Pieters, true? I thought it looked unlike Pieters indeed, Google reckon it's him however.! Will find another pic.